If the World Championships have shown us anything, it's that League is a team game and the best competitors are also amazing teammates. We believe a truly competitive ranked experience should reward a player's ability to lead or collaborate with their teammates just as much as their ability to shut down a lane. That said, for a while now the ranked experience has also been a lonely one, having the choice of either queueing up with a friend or braving it solo. We've even had to go so far as to give small penalties to duo-queuers to compensate for the unspoken benefits of friendship (can you really put a price on friendship?). Our belief is that League is better - and more competitive - with company, so we need to walk the walk on that philosophy. This upcoming season we're replacing the solo/duo queue with a dynamic group queue, where you'll be able to climb the ladder with any number of teammates, going from single participation all the way to a full team comp. There's no longer a penalty for players ranking together, so the benefits of grouping up will always prevail. You'll still need to be of similar rank to your queue-buddies, and the system is designed so that groups will almost always play against similarly grouped opponents (so if you're in a premade five, there's a 95% chance you'll run into another premade five), but now you'll be able to compete the way you want to. Ranked teams will still be available for players who want to form a team of any skill level, as teams are judged on the skill of the static group rather than the sum total of the individuals. That said, this season we're also going to be improving the path to pro, with less ranked team grinding and more focus on performing when it counts. Details to come! For those of you yet to find your trusty battle-buddies, there's no better time than now to consult your friends list (or recruit that support who just carried you) - after dynamic groups go live, we'll be launching with a bonus IP promotion for all parties who play together. Additionally, with Clubs and Parties hitting the stage, maybe your ranked soulmates are just one social sphere away from that push to Challenger. Enduring thirty-minute queue times for reaching the top of the ladder isn't exactly a reward, but that's historically been the price paid when you're incredibly talented at League. We're optimizing high-level matchmaking to identify epically skilled players faster and widen the MMR range for finding games. This isn't the place to get too technical but, essentially, high-level players will be matchmade in the same games that would have happened after a thirty-minute wait, but at a much faster pace. TL;DR: When you're in a division lower than Gold 1, if you lose a promotional series, the next time you enter your series, you'll start with at least one win. Ever since we released the league system for ranked play, we've been following it closely, identifying pain points and looking to add clarity to progression and placement. In 2016, we're adding a new feature to help alleviate "promo anxiety," better reflect improvements in skill, and make it easier to ladder up when climbing to your actual level. Beginning with the start of the new ranked season, if you lose your promos but are still able to get back into a series (demonstrating you've got the skills but just aren't winning in the right order), you'll start that new series off with at least one win. As the TL;DR said, though, promo helper does not apply to promo series above Gold 1. 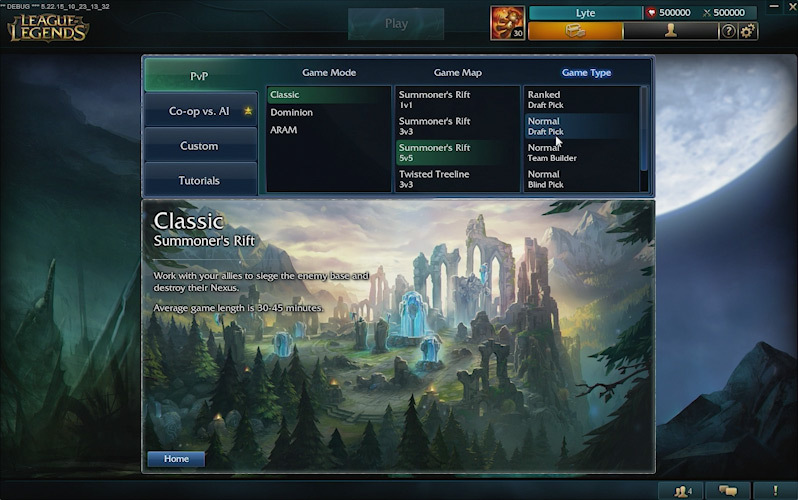 New champion select will debut in ranked play for testing during preseason in NA and TR. Read the lowdown on new champion select here!